Forty-one years ago, I penned this card on a hot, sun-filled September afternoon somewhere in Connecticut. I was in the middle of my first and only acid trip, and spent most of the afternoon loose in a vegetable garden, eating tomatoes and other veggies straight from the vine, no hands involved. In this moment I can taste the scents rising from those warm plants! But then, feeling pensive, I sat down with my journal. I often felt that I was not understood–that I didn’t fit into the culture I was raised in–and the weight of that was obvious to me this particular afternoon. I’m left-handed, and discovered that afternoon that handwriting, for me, always felt like pushing, whereas for right-handed people, it is a pulling motion. So to feel that ease, I wrote backwards for the length of this card, so I too could pull my words like the majority of people. Another way that I could fit in. I remember the sensation now, all these decades later–the ease of it. Simply delicious. 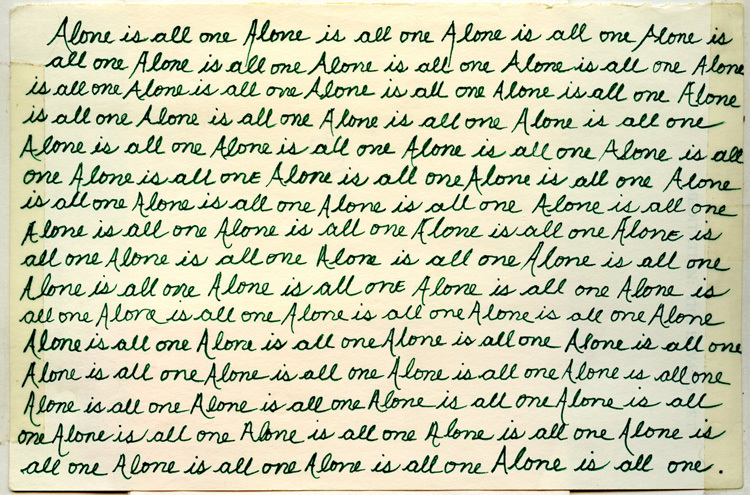 Alone is all one. In truth, there is no separation–even when there appears to be. No wonder I didn’t feel as though I fit into the society I grew up in! There was no one that I could talk to about this knowing. It was many decades before I found like-hearted souls who also know. Some of you are reading this. You know who you are. I bless each of you every day. Really enjoyed this one. We sometimes seem to come full circle.